Google has finally released a standalone Google Calendar app in the Google Play store, giving users a host of convenient time-keeping features as a result. While a Google Calendar app was already available for select handsets, like the Nexus S and Galaxy Nexus, the free download is now available to all Android users running either Ice Cream Sandwich 4.0.3 and above or Jelly Bean. 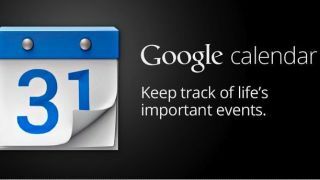 The app can connect with and manage all of a user's calendars, including non-Google ones synced to the Android handset. Users can add, edit, and delete events, respond to event invitations and generally perform anything that could be done with the built-in Android calendar. So why use a standalone Google Calendar app instead of the built-in one? The new app has a few unique features that help it stand out, like the ability to set a home time zone to eliminate travel confusion and an extended sync period, allowing users to recall events up to a year old. Users can also interact more directly with event notifications, such as pressing snooze to have the notification show up again later. The ability to send quick responses directly from an event notification, like when running late or stuck in traffic, is also a handy, face-saving feature of the new app. The real benefit of the new Google Calendar app, for both Google and consumers, is that it's no longer tied just to the Android OS. As a separate app, Google has a lot more flexibility to update and add new features to Google Calendar without needing to send out an entire OS version update. Google has done the same thing in the past with standalone apps for other built-in Android features, like its Google Maps and Gmail apps. Android users still running Ice Cream Sandwich will already get the benefits of that update flexibility. The Google Calendar app gives ICS users the full Jelly Bean calendar suite of improvements ahead of carrier releases for the OS update. Android users looking to keep their schedules as up-to-date as possible can find the free Google Calendar app in the Google Play store now.